Siberian Husky farm in Kropyvnytskyi, Ukraine, was founded in 2011, our dogs are descendants of dogs from leading farms from USA (Kristari’s), Spain(Winterfrost’s), Poland(Winter Melody), Russia(Nord Heart) and France (Of Cool Qater) and many other famous farms. Our puppies have a TOP bloodline, they get timely and professional veterinary care. They also have documents FCI-UKU, chip, professional care and feeding. 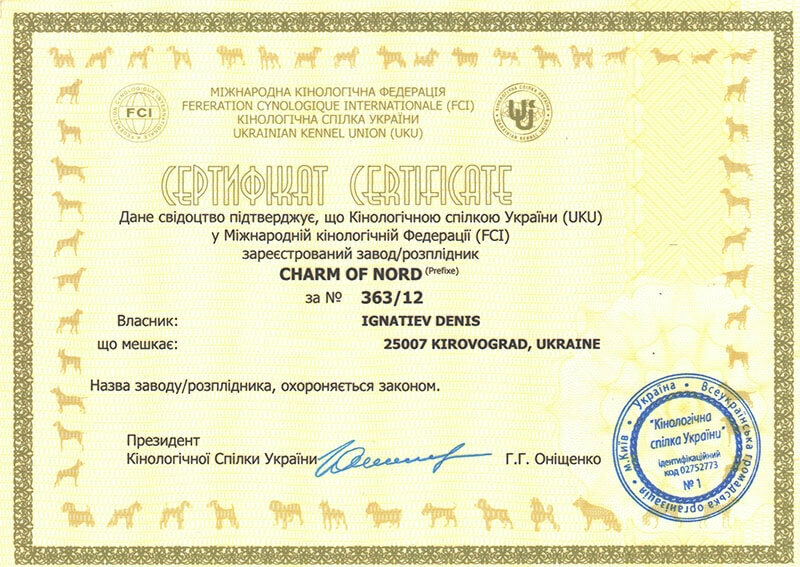 Kennel Charm Of Nord Siberian Husky is ready to provide professional consultation and the transportation of puppies to: UAE, Belarus, Turkey, America and to all the European countries. Dogs and puppies of Siberian husky — Sled, sports dogs, they are friendly and they get along with children. Peace-loving, but also active, rapid and strong sports dogs, which are medium-size and easy to maneuver. They have short and very abundant hair without any flavor which is easy to take care. Husky feels great in both the cage and the apartment. Husky — good-natured and very funny dogs. Historically, aggressive dogs in the extreme north were excluded from breeding. Husky are responsive to kindness and they are generous to show their good attitude. They don’t require professional training, but they easily trained with the right approach. Husky are good in various sports. They are not intrusive, but they like to be in the spotlight. Siberian Husky will become a real friend for you, but you should to take into account all the features of this breed, buying a puppy. Breed lovers strictly adhere to the selection rules, preserving the best qualities of the breed, investing considerable forces in breeding. So the real Siberian Husky dog can be bought only in professional farms, and often by appointment. Not all the husky have blue eyes. Moreover, the best representatives often have brown eyes. Breed standard allows not only blue and brown eyes, but also «mixed-eyes», and also partial coloring of the eyes in both colors. The guarantee of the quality of the puppy can only be its purchase from the farm, which specializes in the breeding of these dogs.